when i was in grad school, i worked as a barista in a local cafe that served quiche for breakfast. each day, two different types of quiche would be featured on the menu. ever since then i have loved quiche. quiche is so versatile because you can put anything in it. the combinations are endless. 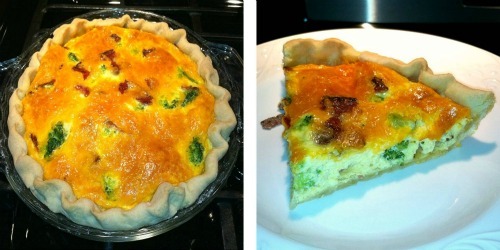 this past weekend, ryan and i made a quiche with broccoli, turkey bacon, and cheddar cheese in it for breakfast. it was absolutely delicious! preheat your oven to 350 degrees F. in a food processor cut the butter into the flour until coarse crumbs form. while the food processor is on, add the cold water until the mixture forms into a ball. on a floured surface roll out the dough to fit a 9 inch pie plate. 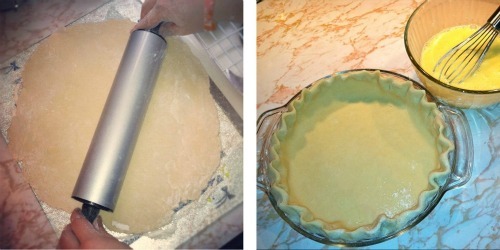 fit the dough into the pie plate, and flute the edges. 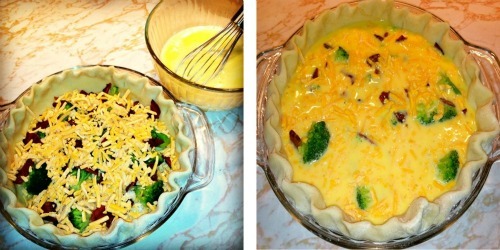 place the broccoli, bacon, and cheddar cheese into the crust. in a bowl, mix together the eggs, milk, and mayonnaise. pour the mixture into the crust. bake uncovered for 30-35 minutes, or until a knife inserted into the center comes out clean. let the quiche stand for 5 minutes before cutting into it. Yummy!!! this looks sooo good!! your recipes kill me! Looks delicious! Check out my H by Halston watch giveaway!